For the past week, I’ve gone to bed every night consumed by the same simple question: Have I done everything in my power to create the best decorated potato I possibly can? Considering that I came up with a possibly unprecedented idea; made three trips to two different grocery stores for a total of 8 potatoes and two six-packs of beer; made two trips to Lowe’s for spray paint and epoxy; went on one nearly endless scavenger hunt for an elusive toy needed to finish it off; and poured in countless hours to the effort, I can honestly say that, yes, I did everything I could. Actually, much more. Unfortunately, a panel of unnamed judges didn’t see it the same way. My potato car didn’t place in Big Boss Brewing Company’s St. Patrick’s Day Potato Decorating Contest. I suppose I should back up and explain how this obsession began. Carve-up, dress-up and display your spud for all to see. Best potatoes should show an original concept and celebrate the season and of course beer! 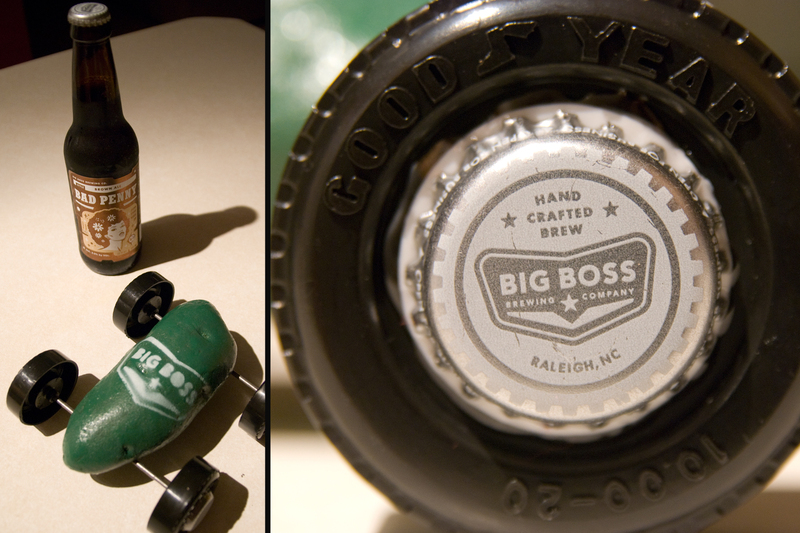 Deliver your fancy potato to Big Boss Brewing by March 16th. Potatoes will be judged overnight and prizes will be awarded on Wednesday the 17th. After a short brainstorming session, I settled on the potato car. A quick Google image search confirmed what I’d hoped. My idea had possibly never been done before. After numerous iterations that rendered potato cars looking nothing at all like a potato on wheels, I settled on my final solution: one large russet potato spray-painted green with a white Big Boss logo stenciled atop the spud, accompanied by wheels ripped off a toy school bus with Big Boss bottle caps as hub caps. Bottle caps, I should add, that I had to carefully pry off the bottles with needle nose pliers, rather than a bottle opener, to avoid bending the top of the caps. After turning in my potato car on Tuesday night and checking out a few of the other entries, I have to admit that I felt pretty good about my chances. Honestly, I felt great. So as Carie and I walked the rickety steps to the brewery’s tap room tonight, my heart was racing. And then I saw it. Behind the bar, the verdict had come down. First, second, and third place ribbons adorned three potatoes. None of them mine. The first and second place spuds were worthy victors. The first place winner showed a potato drinking a beer next to a coffin full of French fries with the title “Irish wake.” Second place, while not as clever an idea as the Irish wake (or a potato car!) was an elaborate spectacle of beer and potatoes. But the third place winner must have bribed a judge. There’s no other way to explain how an entry with a barely decorated potato and absence of a beer theme could win. Clearly, these weren’t sanctioned judges. Of course, I remembered the words I typed in my first entry last night: Anyone Can Enter isn’t about having the fastest time, winning the most prizes, or striking it rich. It’s about having fun and trying something new, if only for the sake of trying. That’s all still true. But it says nothing of totally getting robbed! And quite honestly, this might have been the only Anyone Can Enter event that I can actually win! Fortunately, I know a great way to turn my frustration into motivation. There’s a potato festival in Elizabeth City in May. It just happens that they hold a potato peeling contest. I’ll be entering, and those potatoes are going to get it. Sooo…. did you steal the potato car back? Dude, you were most definitely robbed. That’s a travesty. Is it tasteless to make a joke referencing the potato famine? If not, then this is the biggest potato-related travesty since the potato famine. If that is tasteless, then disregard. In any case, your potato car deserved better. Don’t give up, man. There’ll be other potato-decorating contests out there. When I was reading, I had ideas in my head of what the potato car would look like. Then I saw your pictures, which were MUCH better than my ideas. Well done.